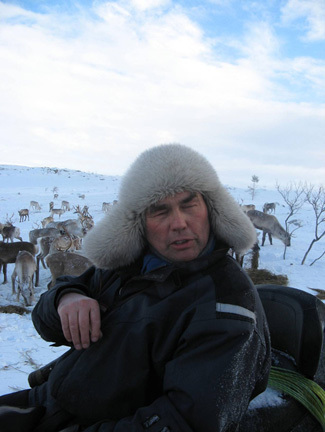 Herding: We met Kurt Magge, a square laughing man with Turkic features, whose openness, honesty, and enthusiasm to communicate his thoughts on reindeer husbandry in a changing world, was of enormous value to the team. The next morning he was generous enough to invite us out to his herds where we spent an extraordinary day. But that’s for tomorrow, all being well! Kurt was born in the 1950s, and started work at 14 with his family. At 19 he’d already taken over the herds after his father died, and now works with a brother, his uncle, and a cousin. These four respective families own the only herd in the whole area around Neiden! They have government concessions over the land they use. This kind of extended-family ownership is typical for reindeer husbandry in the region. Kurt is presently teaching his silent, competent and beautiful 21-year-old son to herd and eventually to take over. In total, the four families represent 15 individual owners, which is why there are 15 different ear marks within the herd’s animals. As there are no other herds in the neighbourhood, the marks we saw are relatively simple compared to the ones in regions with a greater density of herds. In the first week of May the herd moves to an island some 50km North from the winter range. Females give birth there, the calf-marking corral is then operated in July, and the herd swims back to the summer pastures on the mainland. Predators: In regards to this herd, predators are the biggest issue, and this not only during the calving. Fox and eagles are the main predators, with wolves coming in from Russia and Finland who sometimes are responsible for dramatic losses, such as the one that recently killed 15-20 reindeer in two months. This is an especially sensitive issue with the government. In theory, the government compensates losses caused by predators but in practice so few claims have been accepted that an owner rarely receives more than one-tenth of his claimed losses. While photos of mercilessly destroyed animals are presented as evidence, with spore and tracks shown of the predators, convincing government bureaucrats that a reindeer has been killed by such predators is rarely effective. By presenting evidences of predator’s activity, herders look not only for financial compensations but also for a right to shoot the predator. Here they find themselves opposed by the wildlife protection lobbies who don’t know what they’re talking about necessarily, and who confuse traditional predators with much more recently introduced beasts of prey (lynx, eagle for eg which possibly shouldn’t even be there) and muddled (consequently paralysed) government policy. Wolves, wolverine, fox and bear have grown used to modern inventions like the snowmobile, so are no longer afraid of them (they too have become part of the “natural” environment). Hence the predators are part of a changing climate, i.e. they were born and grow up in a technological environment! Climate Change: Regarding Kurt’s understanding and concerns for climate change, he shares with Inger the belief that feeding the animals with additional winter forage is the best strategy towards dealing with the more obvious effects of climate change. i.e by training the animals to greater domesticity they become more easily influenced by human views on adaptability, and can be moved, collected, regulated, with greater facility. Kurt has already noticed that over the last five years the spring and early summer migrations have had steadily to be advanced, to account for the changing weather patterns. He has also noted that in this year (2006/7) the late autumn, created considerable hardship both for his herds, and for many herders throughout Finnmark. In Swedish Sapmi, they talk of this being the worst winter since 1936, with many reindeer starving. This, in a way, proves his point to have begun - a long time ago - to feed his reindeer with hay in winter because of poorer winter forage due to later autumns, winter rain over snow, followed by ice which prevents the reindeer from getting through to the lichens and nourishment with their hooves. This entry was posted on Tuesday, March 13th, 2007 at 8:32 pm	and is filed under week 1. You can follow any responses to this entry through the RSS 2.0 feed. You can skip to the end and leave a response. Pinging is currently not allowed.